A follow-up to his bestselling American Whiskey, Bourbon & Rye: A Guide to the Nation's Favorite Spirit, Clay Risen's Single Malt is an introduction to the long history, fascinating science, and incredible diversity of malted whisky, as well as a practical drinker's guide to buying and enjoying hundreds of the greatest examples of the distiller's tradition. With maps of essential whisky regions of Scotland, profiles of each of the makers, and photographs of the bottles and tasting notes for each of the most widely available expressions--compiled from tasting sessions conducted by a panel of leading whisky experts--readers will discover a rich vein of knowledge about one of the world's most storied beverages. Selected from more than one hundred active distilleries in Scotland, the 330 expressions featured in this book provide a curated yet comprehensive primer of the single-malt whiskies any growing aficionado should be familiar with. 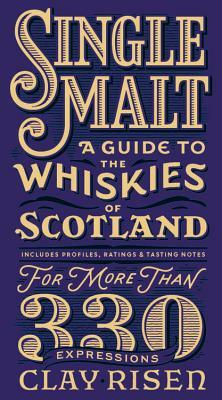 Additional features include a directory of distilleries, Risen's top whisky picks in various categories, and a full index of the expressions featured in the book. Clay Risen is an editor at The New York Times, where he has written extensively on whiskey, rum, and other spirits. He has also written for Smithsonian, The Atlantic, and The Washington Post. He wrote American Whiskey, Bourbon & Rye: A Guide to the Nation's Favorite Spirit in 2013. Risen grew up in Nashville, Tennessee, and now lives in Brooklyn, New York, with his wife and two young children. Follow Clay at clayrisen.com and twitter.com/risenc. "Clay Risen brings a light and unfussy tone to his descriptions of distilleries and the many variations each distillery makes. How reliable are his ratings? He wins me over by consistently scoring bottlings from the obscurish but excellent Springbank above the exposed Glendfiddich." "Risen rates and describes 200+ whiskeys in direct honesty, and delivers a fine, concise history and guide to American whiskey. Tuck it in your hip pocket and go drinking." "A comprehensive and opinionated guide for the intermediate tippler . . . It's a detailed, admirably cranky directory. Risen's tasting notes for each are erudite and fun." "A whiskey novice's best friend . . . It's a book I plan on keeping around for constant reference." "Ideal for the hobbyist and neophyte alike, it makes for a great reference for building your perfect at-home bar."